Publication details: Combo. 2005. xii and 414 pages. Publication date: 2005-08-17. 1193 illustrations, of which 1142 in full color, and 12 tables. Hardbound. With interactive computer DVD (Windows and Mac compatible, however not Mac x-lion), containing the entire book and 4 hours of live surgery video. The fast development of more atraumatic and refined operative techniques in the last decade, and the importance of good long-term results and reduced number of failures in nasal surgery, emphasize the need for an up-to-date, step-by-step operative guide. Although there are many good books on the subject of rhinoplasty, there is a lack of practical guides covering surgical anatomy, pre- and postoperative management, and basic techniques for septal-, tip- and osseocartilaginous vault surgery, especially for the less experienced rhinosurgeon. The first edition of Rhinoplasty was published in 1993 and the second edition five years later. The reviews in leading journals were overwhelmingly positive. Any small points of constructive criticism acted as a stimulus to improve the book, and the third edition, nearly twice as big as the first one, shows that fact. It expands and enlarges the canons of nasal surgery elegantly demonstrated in the former editions. In comparison with the second edition, six new chapters have been developed, including expanded and detailed discussions of septoplasty, ethnic rhinoplasty, refinements of the open approach, alar batten grafting and an enlarged section on nasal reconstructive techniques. Furthermore, a most valuable addition to the traditionally nicely illustrated chapters is an interactive DVD (Windows and Mac compatible), developed by the editor in cooperation with the Audiovisual Centre of the University of Amsterdam. Each user can easily order the contents to his or her needs, interests and level. A user-friendly searching system helps to read efficiently. Another important part of the DVD are the elements of live surgery and the instructive and vivid video clips (4 hours in total) of surgical techniques. No two noses are ever alike and the techniques utilized in rhinoplasty require understanding, technical facility and vital control over the long-term healing process. The pioneers of early rhinoplasty in the late 1800s and early 20th century would take pleasure in the fact that this complex operation still incorporates the fundamental principles identified by these visionary men. It is doubtful, however, that any among them could have foreseen the remarkable refinements rather routinely employed in the past decade. Important developments have transformed aesthetic and reconstructive rhinoplasty from a procedure incorporating primarily tissue reduction and sacrifice to one of tissue reorientation and reconstruction. Time and experience combine to teach that the finest and most natural long-term outcomes are those in which less removal of nasal structures is effected, preserving natural form and function. Clearly the best rhinoplasty surgeons are those who think and plan long-term, tailoring the operation to the exact anatomy encountered, carrying out maneuvers designed to maintain control of the healing process. Cartilage grafting procedures, much more common now than in the past, lend unlimited possibilities to nasal contour sculpturing. Conservative preservation of the various components of the nasal framework and skin-subcutaneous tissue layer now reigns as a fundamental cardinal principle of modern rhinoplasty. For the majority of our predecessors and teachers, the learning process for sophisticated rhinoplasty procedures was a long and arduous process, rooted in trial and error. The past two decades, stimulated by educators skilled in teaching techniques and aided by knowledge gained through anatomical studies and long-term follow-up of patients operated on by various techniques, have borne witness to a significant shortening of the otherwise steep and arduous learning curve to rhinoplasty excellence. Operative television brings the experience and techniques of experts from around the world to the eager learner at the flick of a video control button. The emergence of the open approach to certain difficult rhinoplasty anatomical problems allows the neophyte surgeon an unparalleled opportunity to witness exact relationships and variations in nasal anatomic components. Fresh cadaver dissection experience has clarified surgical concepts of value and disqualified those with questionable outcomes. A plethora of detailed textbooks on rhinoplasty has emerged in the past decade, providing surgical guidance based upon wide experience and careful patient follow-up. To this veritable explosion of scholarly information, Nolst Trenité and his associate authors have added another valuable link to the puzzle of aesthetic and functional rhinoplasty. In the expanded second edition of this successful text/atlas new chapters by surgeons of long experience and vision augment fundamental information from the first edition. A companion interactive CD-ROM vividly portrays operative techniques discussed in the text. Emphasizing throughout the cardinal principles which apply in the overwhelming, majority of rhinoplasty procedures, the authors present here ' in direct and compelling information for the neophyte and experienced surgeon alike. The clear language of the text is complemented by valuable illustrations designed to give the reader the under standing to apply rhinoplasty principles to a variety of anatomical variants encountered. Throughout, the authors uniformly emphasize coordinated procedures to repair both functional as well as aesthetic deformities and disorders. Strong emphasis is placed on the significant advantages of cartilage autographs in the treatment of both primary and revision surgery, a philosophy that is generally shared by knowledgeable surgeons worldwide. Techniques which occasion less risk of sequelae or significant complication predominate throughout the volume. Surgeons who share a deep interest and passion for the complex operation of rhinoplasty will enjoy the clear, precise and pragmatic approach incorporated herein. Dr. Trenité and associates have produced what they sought to achieve - a vital and practical contemporary guide to rhinoplasty. the former editions. Six new chapters have been developed, including expanded and detailed discussions of septoplasty, ethnic rhinoplasty, refinements of the open approach, alar batten grafting and an enlarged section on nasal reconstructive techniques. Furthermore, a most valuable addition to the traditionally nicely illustrated written chapters incorporates an interactive DVD containing elements of live surgery, as well as instructive and vivid videoclips of surgical techniques. Surgeons who share a deep interest and passion for the complex operation of rhinoplasty will enjoy the clear, precise and pragmatic approach incorporated herein. Professor Nolst Trenité and associates have produced what they sought to achieve - a vital and practical contemporary guide to rhinoplasty. M. Eugene Tardy, Jr., M.D. F.A.C.S. This book on rhinoplastic surgery was initiated by the Dutch ENT society because of the increasing interest of ENT surgeons not only in functional, but also in aesthetic surgery of the nose. This interest has been stimulated by a growing demand for aesthetic surgery. In many cases there is a combined functional-aesthetic problem, which can be corrected in a one-stage operative procedure. The fast development of more atraumatic and refined operative techniques in the last decade, and the importance of good long-term results and dwindling mishaps in nasal surgery, emphasize the need for an up-to-date, step-by-step operative guide. Although there are many good books on the subject of rhinoplasty, there is a lack of practical guides covering surgical anatomy, pre- and postoperative management and basic techniques for septal-, tip- and osseocartilaginous vault surgery, especially for the less experienced rhinosurgeon. 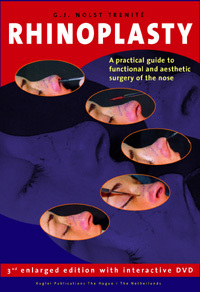 This book is divided into three parts: the basic knowledge needed for rhinoplastic surgery (part I), the different operative techniques (part II), and capita selecta of special problems (part III), written by internationally renowned authorities on rhinoplasty. We hope that this practical guide will be of use to many surgeons by helping them to perform one of the most challenging aspects of facial plastic surgery: rhinoplasty. It is with great pleasure that I present the second enlarged edition of Rhinoplasty: A Practical Guide to Functional and Aesthetic Surgery of the Nose. The first edition was sold to all parts of the world, from Japan to Colombia in South America. The reviews in leading journals were overwhelmingly positive. Any small points of constructive criticism acted as a stimulus to improve the second edition. The book has been considerably extended and now contains 300, rather than 200, pages, not to mention about 200 extra full-color illustrations and three new chapters: 'External rhinoplasty, the benefits and the pitfalls', 'Nasal vestibular stenoses' and 'Guidelines for cadaver dissection'. The purpose of the last mentioned (a unicum in textbooks on rhinoplasty) is to stimulate neophyte rhinoplastic surgeons to start practising modern rhinoplasty techniques on cadaver specimens before proceeding to patients. A fourth new chapter, 'Surgical management of large septal perforations' by R. Meyer, on the very challenging treatment of septal perforations, replaces his earlier contribution 'Tip columella and ala'. Moreover, a completely new teaching tool has been developed with the help of ETI (Expert Center of Taxonomic Identification) at the University of Amsterdam: An interactive CD-ROM with live-surgery video (click to a see screenshot of the video gallery) coverage of the different surgical procedures linked to the corresponding chapters, which enables the user to observe the surgery in combination with the techniques described. I sincerely hope that this second enlarged edition, combined with its specific interactive CD-ROM, will contribute to shortening the learning process in one of the most difficult aspects of facial plastic surgery: that of rhinoplasty. After the first edition, which was published in 1993, and the second edition with interactive CD ROM, published in 1998, this third edition is even more extensive, containing six new chapters: Septal surgery basic techniques; New concepts in reconstructive septoplasty; Developments in the open rhinoplasty approach; Ethnic rhinoplasty; Batten grafts for nasal valve collapse; and Nasal reconstruction. Moreover, a sophisticated new interactive DVD has been developed in cooperation with the Audio Visual Center at the University of Amsterdam. Its goal is to provide a practical guide with the maximum impact on teaching. The DVD contains more than 4 hours of live surgery and there are short video clips on specific surgical techniques to complement the various chapters. The many positive reactions from all parts of the world regarding this practical guide to functional and aesthetic surgery of the nose, which has helped colleagues improve their surgical skills, have been a huge stimulus. Once again, I sincerely hope that this third edition, with its interactive DVD that explicitly shows most of the modern techniques in rhinoplasty, will be of benefit to surgeons who wish to improve their skills in rhinoplasty, which today still remains the most challenging and difficult surgical procedure in plastic surgery of the face. Foreword, M. Eugene Tardy Jr.
As its title suggests, the book is indeed a valuable guide to step-by-step rhinoplasty surgery. Now in its third edition, the book has been expanded with six new chapters and six additional authors. As before, it is divided into three parts: basics, operative techniques and a capita selecta of special problems and/or other techniques. The first part includes clear, well illustrated chapters on anatomy, aesthetics, anaesthesia and pre/post operative management of the rhinoplasty patient. The second part covers common operative techniques and starts with a chapter on septoplasty and turbinate surgery to continue with chapters on grafts, alar insufficiency, nasal valve, tip surgery, osseocartilagenous vault, open rhinoplasty and alar base resection. All are illustrated with clear diagrams and generous photography. The first and second parts in themselves comprise an excellent introduction to the novice rhinoplasty surgeon. The third part of the book contains 16 chapters on various problems and conditions in rhinoplasty such as cleft-lip nose, opverprojected tip, saddle nose, augmentation rhinoplasty, repair of septal perforation, surgery in children, revision rhinoplasty and vestibular stenosis. A chapter on cadaver dissection is a useful guide to practice various rhinoplasty techniques. The new chapters on the nasal septum in rhinoplasty and septal reconstruction with PDS foil as well as those on new developments in open approach, ethnic rhinoplasty and batten grafts present additional techniques and knowledge of the latest developments. Finally the inclusion of a comprehensive chapter on reconstruction of skin cancer defects will definitely satisfy those with interest in this area, of which many are rhinoplasty surgeons. The book is complemented with a DVD-Rom which includes clear videos of main rhinoplasty techniques and four hours of live operating. The full text of the book is included in the DVD and is cross referenced with the video clips. I have enjoyed reading this book and have found it an extremely useful guide. It is unique in being a real practical guide for the difficult operation of rhinoplasty. I do recommend it for both beginners and experienced surgeons who like to keep abreast with current rhinoplasty surgery. By: Melvin A. Shiffman, M.D., J.D. This is the second edition on functional and aesthetic rhinoplasty. This book is a step-by-step operative guide, and has an interactive CD-ROM with live-surgery video, coverage of the different surgical procedures linked to the corresponding chapters. Part 1 is on the basics of rhinoplasty and includes anatomy, aesthetics, preoperative management ' anesthesia and preoperative medication, and postoperative care and complications. There are excellent illustrations. Included are forms for SEATO-rhinoplasty assessment and septorhinoplasty operation. Early and late complications are described. Part 2 is on operative techniques, and includes septoplasty and turbinate surgery, grafts, alar insufficiency, nasal valve surgery, approaches to nasal tip surgery, surgery of the osseocartilaginous vault, open tip rhinoplasty, external rhinoplasty, and wedge resection in alar base surgery. Each of the operative procedures is described, with accompanying photographs and illustrations for case of understanding. The third part handles specific problems such as secondary surgery of the cleft-lip nose, the overprojected nasal tip, augmentation rhinoplasty, management of large septal perforations, reconstruction of saddle-nose deformities, rhinosurgery in children, revision surgery, and nasal vestibular, stenosis. There is also a guideline including operative techniques and graft harvesting. This book is an excellent addition to the cosmetic surgeon's library with an easy-to-follow guide to functional and aesthetic surgery of the nose. Melvin A. Shiffman, M.D., J.D. This is a review of a book entitled Rhinoplasty, A Practical Guide to Functional and Aesthetic Surgery of the Nose (2nd edition). Edited by G.J. Nolst Trenite. This text is a text/atlas with companion CD Rom that portrays operative techniques in rhinoplasty. The text is clearly written and well illustrated. There is a strong emphasis placed both on functional and aesthetic considerations. The book is a clear, precise pragmatic reference. The book is organized into three sections - basics, operative techniques, and capita selecta. In the basic section the anatomy, pre-operative analysis, and other considerations are well handled. The bulk of the book, the operative techniques, is a thorough step-by-step review of important rhinoplasty techniques. The third section incorporates selected subjects of interest and also has an illustrated cadaver dissection. All in all, this book is a valuable addition to the significant number of detailed textbooks that have come forth on rhinoplasty in the past decade.